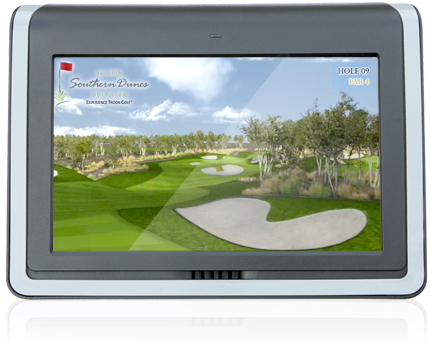 A Precedent equipped with the Visage Mobile Golf Information System forges new and profitable interactions between operator and customer. For the first time ever you can maintain constant contact with every Precedent in your fleet; you can communicate directly with your customer and suggest lunch at the turn, deliver a better tournament experience, and ensure guests and assets remain safe and secure. The more you ask of a Visage-equipped Precedent, the more it can do for your operation. As connectivity affects every aspect of our lives, who else but Club Car could pioneer its integration into golf cars? A solutions platform that is expandable and customizable according to your preferences, connectivity is engineered directly into the Precedent i3. You decide how many of the connected features you want to add to your fleet-from simple diagnostics, all the way up to Visage, our premier suite of connected features. In the Age of Connectivity, this cloud-based system lets you connect any time, anywhere from your computer or mobile device and always know what your customer wants, what your fleet needs and what's happening out on your course. With this information, you'll enjoy an unprecedented measure of control over your fleet, maintenance and operation. And you know where that leads: Success. Your course and fleet are your greatest assets. Visage protects both by reducing golf car abuse, accidents and theft; at the same time, it's also looking out for your tees, greens, bunkers and sensitive areas. 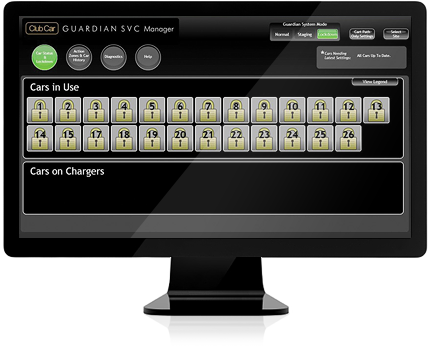 Visage can diagnose potential fleet issues before they can impact a customer's round. If a rogue charger could compromise other vehicles, you'll see it on the easy-to-use Visage Command Center. Visage helps you keep cars out of lakes, creeks, sensitive areas and away from potentially hazardous areas like parking lots and roads. Easily set your no-go areas from your PC. Lock them in or change them daily. 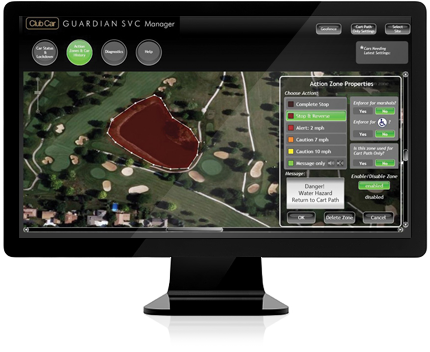 With Visage guarding your tees, greens, bunkers and sensitive areas, maintenance and repair costs go down. Mowing crews mow rather than move signage and ropes; superintendents orchestrate workers around golfers. Productivity goes up, overhead goes down. Find a Visage-equipped vehicle quickly anywhere on your property. If a car leaves the mapped property, Google Earth technology kicks in to locate the car. In Lock down mode, cars won't move. Period. The best way to discourage theft, joy rides and vandalism. 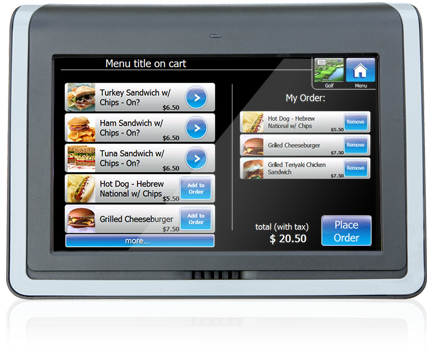 Promote and sell higher-ticket items in the grill and pro shop ... speed up pace of play and accommodate more rounds ... invite groups to book their next tee times on the 18th hole-and that's just a taste of how Visage contributes to cash flow. Visage makes everyone a better marketer. The colorful display and messaging features are powerful tools for promoting higher margin items like hot sandwiches, craft beers, protein bars and energy drinks. That's where real profit lives. Once they've tried Visage, golfers never want to play without it. Aside from the precise yardages and available hole flyovers, golfers value the instant contact with the pro shop and grill, and the high-touch service Visage delivers. Golfers easily set up scoring for as many as four players. At the end of the round, they email their card to themselves. And you capture that data for future marketing. Score more tournaments and charge more for them. Visage puts a real-time leader board in every car so groups always know where they stand in the event. Combined with Visage's other service features, tournaments at your course will stand above the crowd.